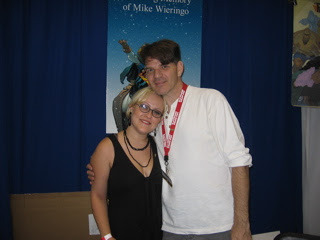 back from the baltimore comiccon! the other day, when i did my little dissertation on our run of sensational spider-mans, i (purposely) neglected to mention the third member of our web-thwippin' team, my pal, rich case. and so, with mike and i hired on to write and draw sensational spider-man, it was rich, mike's studiomate, who was lured in to be the inker. a power trio to be reckoned with--we had fun! well, mike and i did. i can remember thinking that rich was gonna hate us our third issue in when the villain was the bee-colony, hive mind known as SWARM! i had all of new york infested with a plague of bees, there were bees everywhere!...and rich had to ink them all! hundreds and thousands of little, tiny, buzzy bees...! as mike would need a break now and then from the monthly grind, rich grabbed me at the end of one of our group phone calls to ask if i'd wanna do a fill-in issue with him? that he had an idea and maybe we could spitball it a bit. 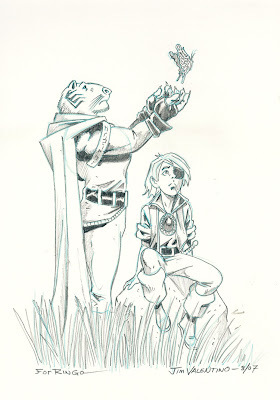 now, i'm thinking, i'm gonna be able to work with rich as a penciller?! man! too cool! 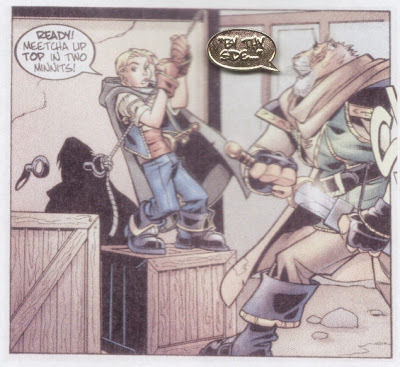 what weird, bizarre, guy-with-a-chandelier-for-a-head, wackiness could i come up with for rich to pit against spidey? fortunately, rich had much more than just an idea. and one issue became two, featuring spidey versus the new living pharaoh, and the creation of a girl named akasha. rich and my friend, andrew hennessey, and i even took a trip to the metropolitan museum of art to get some reference photos for rich and absorb as much of that ancient egyptian flavor as we could get. the issues turned out great! currently, rich is working in video game design and doing some of the coolest stuff i've seen in a long time! 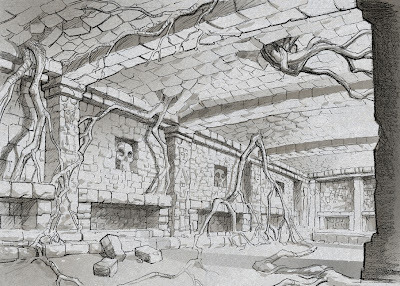 i have to say, i'm fascinated by the whole process, seeing these things go from sketches to drawings to 3d art to actual buildings and landscapes and worlds that you can walk around in! as he takes us through the process and shows how it all comes together! 1. what was the name of the arcade video game that featured a spy traveling from floor to floor in a building shooting counter spies? 2. what were the names of the ghosts in pac man? 3. what was the name of the sequel to nintendo's banjo and kazooie? 4. who is the hero in the legend of zelda? 5. what does tetris mean in russian? because we play volleyball on monday nights, and because we didn't get dvr until just a few months ago, sharon and i spent most of this weekend watching the last three discs of HEROES season one. i had watched the first episode way back when and felt that, for a comic book geek, a lot of what they were doing was a bit cliche and didn't know if i'd dig it. as the season went on though both craig and scott told me that it was actually moving beyond the usual and that it was definitely worth checking out. 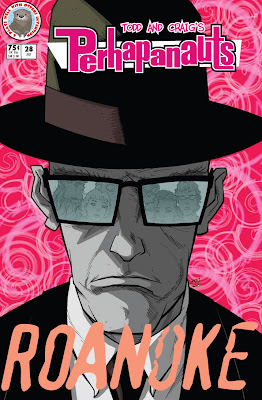 we really dug it and, of course, fell in love with all of the characters, and while i wrote an amazingly different (read: better : ) finale in my head, all in all, we can't wait to see what happens to the now familiar gang. and to meet the new ones. along with my name is earl, 30 rock, the office, and saturday night live, i've got heroes on a season pass. i'll add lost in january. and i'll probably add chuck, pushing daisies, and a couple more beefore the week is out. what new shows have piqued YOUR interest? what old shows can you not wait for? the other night, in new york city, marvel comics and the heroes alliance hosted a really nice get-together/tribute for mike wieringo, giving both fans and professionals alike a chance to come together, remember mike, and raise some money for a couple fo good causes! we all congregated at flatiron joe's, a cozy little pub/restaurant on 21st st, at about 7:30 pm. marvel ed-in-chief, joe quesada said a few words, i said a few words, and then the night began, as a handful of artists began sketching ! dennis callero, amanda conner, jae lee, jimmy palmiotti, joe quesada and his daughter, carly, rodney ramos, tom raney, paul renaud, paulo rivera, walter simonson, and arthur suydam all donated their sketches to an auction that raised over $4000 in about 2 hours! also on hand were joey cavilieri, dan didio, and jan jones from dc comics, nick barucci of dynamic forces, and a ton of editors and production people from marvel; john barber, nathan cosby, jen gruenwald, molly lazer, nick lowe, andy schmidt (a bunch more, but those are the people that i had long conversations with...). cb cebulski--though i'm never quite sure who he's working for. 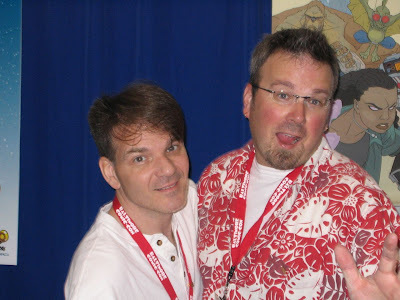 and my good pal and spider-mentor, tom defalco! 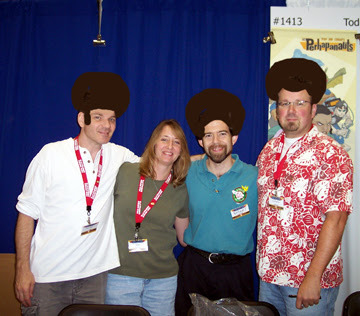 we had a sort of tellos mini-reunion as colorist, paul mounts, and inker, rob stull, came by. anyway, it was a great night for a great guy and i wanna thank everyone who came, everyone who donated their time and their talent, and everyone who put it togetehr and made it a huge success! that said, i'm working on a comic. it was nate's idea--and he's got a lot of 'em!--to do a special, fun (emphasis on the fun!) issue of spider-man family and dedicate it to mike. so he rounded up mark waid and karl kesel (mike's partners on his run of the fantastic four) and me ('cause of our time on sensational spider-man) and set us to work on a fun little romp that mike and i had actually been hoping to do as a four issue miniseries sometime in the future! it's called "looter's quest" and, though a bit truncated from it's original idea, the three of us have filled it with lots of the kindsa things mike (and we) loved in comics! we're using the ideasx mike and i had come up with, karl is going to both pencil and ink it (woo hoo! it looks great!) and mark and i (and probably a little karl) will throw the dialogue down later! it should be out sometime next spring! 21, 22, 23--guest-starring doctor strange! 27 and 28--spidey as...the hornet! the 2-part "identity crisis" storyline featuring, once again, the hilarious looter and the vulture! 31--spidey vs, the rampaging rhino! sensational spider-man # -1--the flashback tale that received so much attention. so go check 'em out. or, hopefully, in the very near future, marvel will be collecting these "best of 'ringo" spideys in a few cool trades! anyway, i really wanted to include a "five for friday" trivia, but i gotta get back to work! so why don't you try to stump me? submit YOUR five (or less) questions in the comments section and we'll see how i do. as promised sometime last week, here are all the plates from the PERHAPANAUTS "Lost Covers" Portfolio. for those of you who might have been absent last week (and where is your note...? 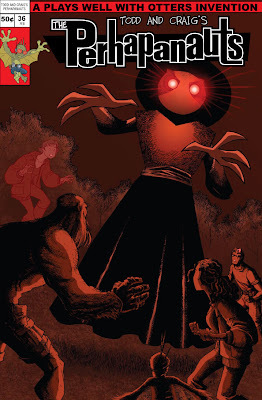 ), the "lost covers" portfolio consists of five original plates featuring the covers to past issues that never existed. what i mean is, they are the covers to the issues that were referred to in the letters column but never were. they also come in a snazzy wrap-around cover and feature the original letters that inspired them. craig did a phenomenal job with them and you can have the set for a mere $20 (us) plus shipping. 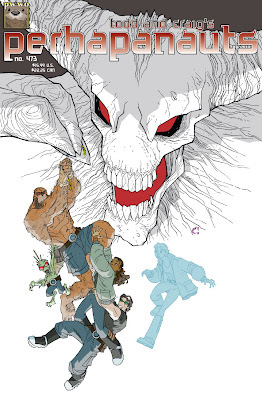 check out the "buy stuff" section on the perhapanauts main page. all proceeds go toward paying rico for printing them up. just a lotta nonsense to post today. hope this helps get your week started on the right foot. since sharon moved in three months ago, we've been now trying to perfect the perfect burp. 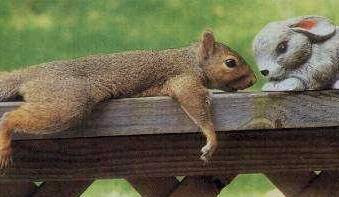 soda, as you see, helps. 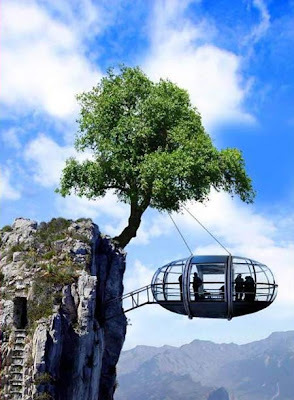 i would totally love to live here. did i post this before? while i have stated that i didn't want to perpetuate any SAD feelings here in the case of my fallen brother, i will, from time to time, post some things that were sent or given to me that remember mike and pay him tribute. one of our friends here on the blog, mike estelle (who i always think of as mike heywood 'cause of his blogger name, heywood jablomie), sent me the piece below several weeks ago. i really wanted to post it, but also wanted to give it time. or wiat for the right time. i think that time has come. first though, here are a trio of tribute pieces that other artists have done to remember mike. and now, here's mike's story. Jarek and Koj ran as fast as they could. They had parted ways with the rest of the gang to try and trick the forces of Malesur, but it didn’t seem like it was working. For all their attempts they just could not shake them, the crazy frogsoldiers would just not stop! As they continued on through the thick setting of trees, they felt the ground start to tremble. 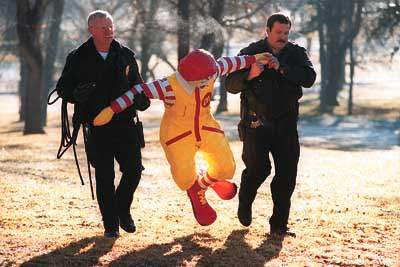 Then the trembling got worse and they were both knocked off of their feet as they broke into a clearing in the woods. When they finished tumbling into clearing the earth shook so hard that it opened up right in front of their eyes. The frogsoldiers, not being able to stop themselves tripped over the pair and fell right into the newly opened crack. “Um, Koj,” said Jarek over the sound of the earthquakes. “What do you suppose is going on? The skies then began to darken with black clouds roiling in from all directions. The pair regained their footing and stared in awe as the skies opened up with massive amounts of rain. The ground began to shake again as lightning and thunder began to rip across the now completely blackened skies. They both ran off in the direction they had just come from to find something that would help them survive this wild turn of nature. Upon coming to a roadway they bolted as fast as they could towards the nearest town. The ground was shaking worse now, and the rain started to come down even harder. They thanked the gods that at least the lightning and thunder stopped for now. After almost passing out from the exertion of running they finally got near town, only to find the local townsfolk running towards them. “What’s going on?” They asked anyone who would stop. “The town is being ripped apart from the earthquakes, it’s not safe to stay there!” replied a man carrying two infants. The two of them just looked at each other and mouthed a silent “Great!” Then they ran down the road to find somewhere to hide from the weather. 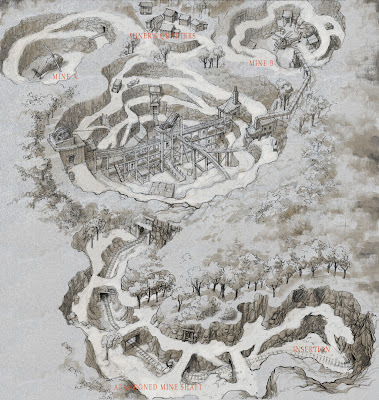 Not too far from our distraught heroes were Serra, Hawke and Rikk, currently they were dealing with trying to outwit and outrun a group of shadowjumpers. While Jarek and Koj ran east, they decided to run west. The route they took brought them to a large lake that was at that very moment surging in their direction in a very large tidal wave. Of course being that Hawke and Rikk were involved, luck was not on their side. The wave hit them full on and carried them into a small grove of trees and left them hanging in the upper branches. After falling out of the tree that’s when the three of them landed in the middle of the group of shadowjumpers. The ground then shook with a massive force from a crash of thunder, knocking everyone off guard, that’s when the unlucky trio decided to bolt away from the shadowjumpers. At this point the rain started to come down and it made it hard for them to see where they were trying to go. After blindly running through the dark and pouring rain the came to a dead stop at a cliff side. Trying to look around the found that the cliff ran in both directions and they realized they were trapped. Lightning races across the sky lighting up the area just as the shadowjumpers caught up with them. The ground shook again and that’s when the avalanche started coming down around their very heads. The moment the earthquakes hit, but before the skies grew dark, Thomestharustra knew what it was that happened. 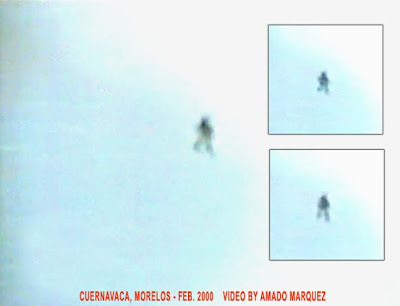 He also knew he had the find Jarek and his companions right away. He left immediately and followed the first trail he found, that of Serra, Hawke and Rikk. His need to get to them urgent, he relied upon his magics and found them in no time. Jarek and Koj finally found shelter of a sorts from the rain at least, the earthquakes were proving to be another beast altogether. Their path took them to the top of a plateau overlooking the countryside. Upon that plateau was a small cave, which seemed to be holding up pretty well on its own so they took cover from the pouring rains inside. With the ground shaking, they weren’t sure if the roof of the cave would fall in on their heads. The earthquakes, lightning and thunder all seemed to letting up a little, but the rain just kept coming down. Jarek huddled up against Koj for warmth as they both looked outside the cave wondering what happened to the others. “Ya think they’re ok?” asked Jarek. They both chuckled, but deep down they were afraid. Then without warning there was a bright flash of light in front of them, and they had to cover their eyes or risk going blind. Serra was the first to notice the flash of light surround them as the rocks started falling around them. After what seemed like forever, the rocks sounded like they stopped coming down. Then the light expanded and pushed the rocks off of the three of them. They looked around and saw a pile of rocks where the shadowjumpers were, a small piece of black cloth flapping in the wind under one of them. She then noticed the source of the light came from the silhouetted figure to their left. She recognized him right away. He cut her off, “ We don’t have time to talk, we must get to Jarek and Koj right away!” And with a slam to the ground from his staff they disappeared. 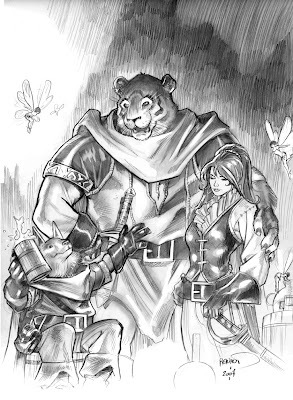 The flash of light dimmed down to the brightness of a torch, and Jarek and Koj were able to see that it was Serra, Hawke and Rikk standing in front of them, with Tom a little to the side. The pair got to their feet. They all looked at each other in fear and sorrow. Then they looked outside as the land still raged, and the rain still fell. A few days pass, and the six of them still sat in the cave watching the land continue to rage. The earthquakes had stopped for the most part, only shaking the earth once in a while. The rains still came down, but the skies weren’t as dark anymore, and the lightning and thunder had ceased. Then the ground shook violently one last time, and the clouds started to dissipate. All six got up and walked out of the cave to the overlook. As the sun started to break though the clouds the blue sky peaked out until it shone brightly over the land. The rain continued, but it was very light. Jarek looked over at Koj, then at the rest of the gang. Faces wrought with sorrow they each looked back at him. He then looked at Tom. I dedicate this story to Mike, Matt, Todd and Mike’s family, friends and fellow fans. Thank you for leaving us with so many great memories, stories and wonderful characters. You will be missed but never forgotten. 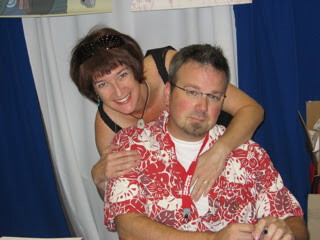 thanks to everyone who commented on the baltimore blog--we had a great time and wish you ALL coulda been there! my pal, leaf (christian), asked if we could all see a pic of the beautiful "by thy side!" pins that john higashi has made and i remembered (as i was trying to take it) that i can't take a picture to save my life!! and last but not least, for those of you who didn't see it posted over on craig's site, here's another one of the "lost covers" from the portfolio that craig did for the show. i'll post another on friday. 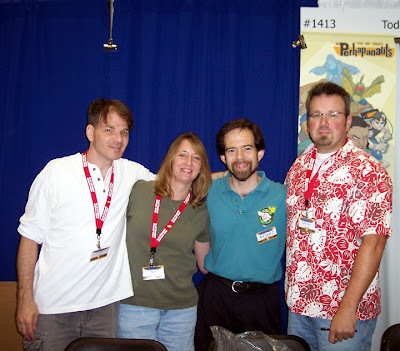 comics lover, art buyer, and especially, mike fan, john higoshi, had thousands of buttons/lapel pins made up featuring the tellos coda "BY THY SIDE!" that weere given out to anyone who made a donation to the humane society in mike's name. 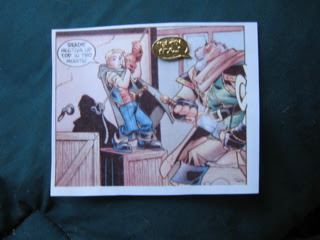 the small gold pin came mounted, actual size, on the panel it first appeared in tellos #1. we couldn't keep them on the table. marc nathan, organizer of the con, and his get-it-done, go-to, right hand man, brad tree, set up a table--and a fund--in mike's name where many of us signed and sketched to benifit the humane society. I don't know how much they raised, but i know it was a lot! on saturday afternoon there was a wonderful...i don't know what to call it...tribute panel to mike, hosted by mark waid, cully hamner, scott kurtz and myself. i say i don't know what to call it 'cause it turned out to be a lot of things, lots of laughs, some reminiscences, a few tears...but it also got a bit blue. 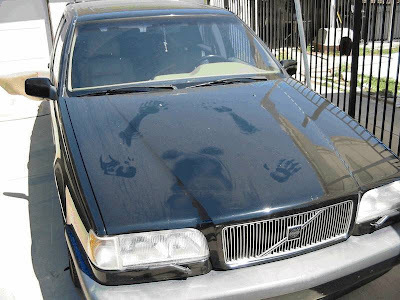 things got a little raunchy once or twice, but i can't tell you right now--mike woulda liked it! on saturday night, mark (waid) hosted a open private wake for pros and people who knew ringo. mark had arranged for an open bar and some wonderful appetizers, and the place soon filled up with so many of the top talent in the comics industry today. cully had made some really great billboards of mike and so we all felt him there. mark said a few words and i echoed his sentiments, nick barrucci toasted mike, and erik larsen noted how we should all appreciate each other, while we're here. it was a winderful evening. mike woulda liked it! 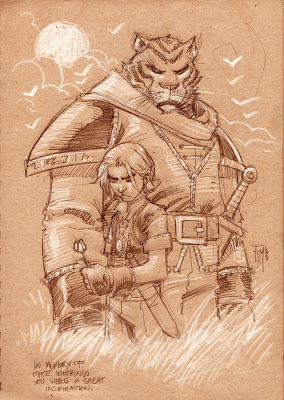 craig and i--well, i really think it was more brian and sharon--sold a bunch of perhapanauts trades and craig debuted not one, but two new canson paper sketch books (if you haven't seen his gorgeous work on these, check out some of his stuff on www.craigrousseau.com !)) 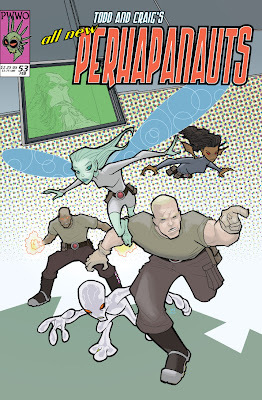 but the big draw wwas the perhapanauts "lost covers" portfolio! i'll be showing the other covers over the next week or so, but craig and i were stunned at how very popular they were. we have a few left and they will be available for sale very soon, so keep your eyes peeled for more on this cool new perhapa-thing! and so, it was a great show and, though craig and i were sure we were gonna have a really hard time of it, going to a convention for the first time in a looooong time without our third musketeer. 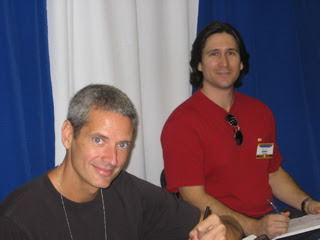 but with the help of "the girls" (sharon and trish), and friends (like mark waid, cully, scott kurtz, randy green, kelly yates, rico, and so many more) and especially mike's many, MANY fans...we got through it. so here are a bunch of random pics--i didn't get my camera out until sunday, didn't get too far from our table, and didn't get any shots of a lot of the people i shoulda...) next year, YOU come to the show and take some pictures for me...! my pal, xan sprouse, hugs me and tells me she's gonna put the picture on her myspage, but i am NO elvis costello! my pal, alicia, who is always smiling and is cute and does me favors like driving my too-big-to-get-on-the-plane flatboxes back to albany for me. and i will make it up to her. 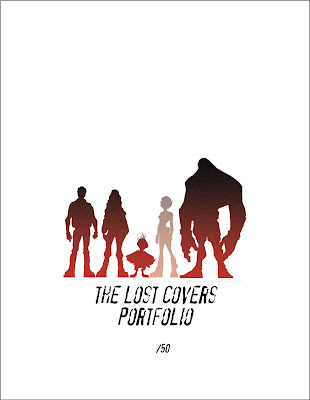 two days 'til baltimore...and the lost covers portfolio!! i'm hangin' out today with my niece and nephew for one last day of summer before school starts on thursday. big news is, as the subject of this post proclaims, TWO DAYS UNTILTHE BALTIMORE COMICCON!! of course, if you're in the neighborhood, DON'T MISS OUT!! 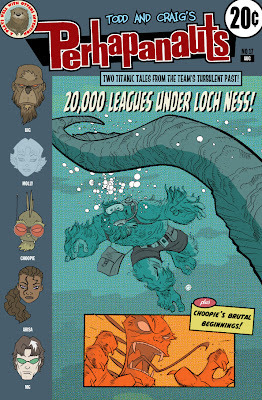 come by and see us and take a look at the awesome cool PERHAPANAUTS "LOST COVERS" Portfolio!! you've already seen one of these beautiful plates from rough to finish--CRAIG IS AWESOME! !--and here's a look at the cool cover to the port! as you can see, we're only makin' 50, and they are a BALTIMORE COMICCON EXCLUSIVE! !, but, as always, if we have any left over, we will make them available here through the website. when we return, we'll give ya a glimpse of the other covers, but let me just tell ya now--they're gorgeous!!! 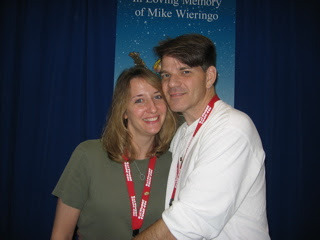 i have also been waffling about whether to post more stories about mike and tributes and the like here on the blog or trying to post more positive, upbeat things to help everyone move on. 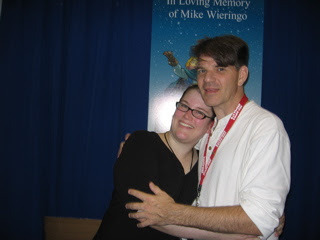 marc nathan, the organizer of the baltimore show, and also a really great guy, wanted desperately to create a tribute to mike in some way and, knowing how much animals meant to mike, has made arrangements with the baltimore humane society to create a fund in mike's name. they will have a table there at the show where, craig and myself and mark waid, along with artists like cully hamner, randy green, kelly yates, and scott kurtz, will be signing and sketching and raising money for the humane society. 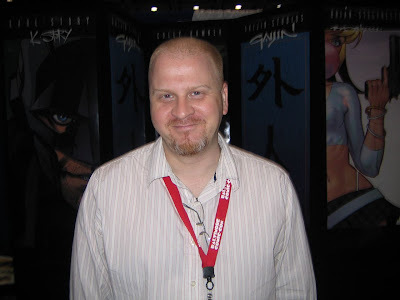 there will also be a special memorial panel on saturday for mike that mark (waid) and i will host where fans and pros will be invited to come and share their stories of goofy, funny, talented, compassionate, encouraging, generous mike wieringo. so if you're at the show, make sure to come and see us! it willbe a little strange, a little lonely for craig and i, going to a show without mike (and truth is, we almost decided NOT to go...) but i'm sure that if we all try real hard to remember the good times and the great guy he was, we'll be able to conjure up enough mike to have a great time! quick one today and HAPPY LABOR DAY EVERYBODY!!! 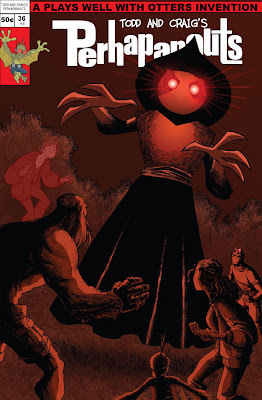 here, as promised, is the final version of craig's awesome flatwoods monster cover for perhanauts 36. as you'll see, each of the covers pays a bit of homage to covers of yore; this one sports the trade dress of a marvel comic circa 1983.
have a great day! see ya wednesday!